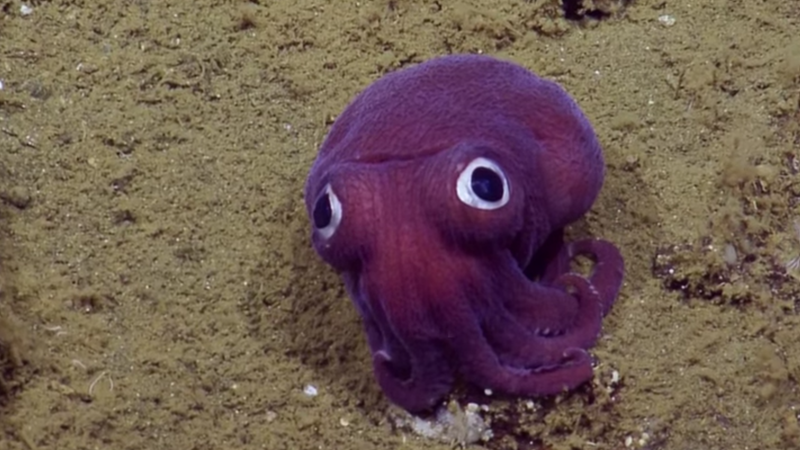 While scientists were exploring off the California coast, they happened upon this adorable li’l googly-eyed squid. The team later discovered that this is, in fact, a special creature called Rossia pacifica, or stubby squid. According to the caption of the YouTube video, although the creature might look like a cross between an octopus and a squid, it’s actually more closely related to the cuttlefish. “This species spends life on the seafloor, activating a sticky mucus jacket and burrowing into the sediment to camouflage, leaving their eyes poking out to spot prey like shrimp and small fish,” writes E/V Nautilus.